The Guards Museum, which opened in 1988, tells the story of the five Foot Guard Regiments of the Household Division, providing an exclusive insight into the Foot Guards and Household Cavalry, their combat histories and present day function. It was created as an educational tool for the newest intake of Guardsmen and includes displays of uniform for the five Royal regiments dating from the Civil War, with details of the nature and origin of their ceremonial duties right up to their contemporary role. 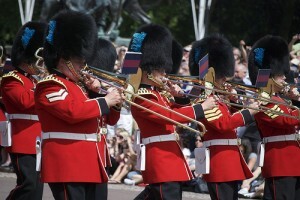 Set opposite St James Park in Royal grounds, the London Guards Museum also gives an excellent overview of the importance of the Royal Family to the Nation throughout history and their long association with the military. To anyone interested in the military heritage of these world famous soldiers this London tourist attraction is a must-see. All exhibits are in floor to ceiling glass cabinets so there are low level exhibits for young visitors.